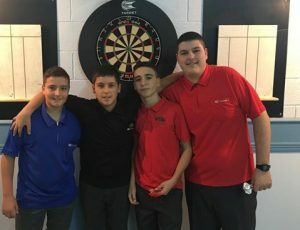 The second youth ranking of the season was a night of upsets, with the top seeds crashing out of the competition in the early rounds. The likes of Craig Galliano, Jerome Duarte and Ethan Smith were all beaten in the early rounds this meant a new name would have their name on the title. The star of the show and winner of the event Justin Hewitt managed to win the tournament in remarkable fashion. The underdog managed to take out Jerome Duarte in a thrilling match up. This was anyone’s match, but it was Justin who managed to hold his nerve for a win over Jerome, who managed to score heavily during this game including a 180. Justin clinched wins over Jayc Alecio and Ethan Cleverly. Justin also managed to hit a 180 followed by a 131 finish in the second leg over Ethan Cleverly. Sean King Negrette enjoyed his best ranking run with wins over Joseph Borge, Ethan Smith and Kaylan Franco. Kaylan caused the biggest upset by defeating Craig Galliano who recently enjoyed a good run earlier this month at the World Masters. Nevertheless Sean managed to beat Kaylan in the semis to eventually book his place in his first final. In the final Justin Hewitt managed to maintain his brilliant form vs Sean King Negrette, this form helped him secure a 4-0 win. This now gives both Sean and Justin some crucial ranking points in their quest for qualifying to take part at the 2017 Youth European Cup in Sweden.